Discussion in 'MOC 2019 Challenges' started by bellbird, Jan 16, 2019. I can sing a rainbow, sing a rainbow..."
Whether you grew up with this version of the Rainbow song, or were taught the ROY G BIV way of remembering the colours of the spectrum, today's challenge is all about colour! Multiple colours! For today's challenge page, you will use all 7 colours from the Rainbow song above and make a page featuring them as blocks of colour. To show off the colours, you will use them on a solid black or white background. They can be subtle or vibrant but you must represent all 7 distinct colours. You must have a separate item or element for each colour and each colour must be clearly seen on the page. For example, you cannot use one ribbon with orange, yellow and red on it. You can use an orange ribbon, a yellow ribbon, and a red ribbon. Additional elements such as wordart, fasteners and doodles in black, white, silver or gold are fine but the colours should still shine on this page. And remember while you are searching your stash, one of the best things about digital scrapping is that we can recolour anything! 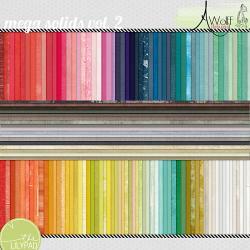 - different coloured alphas against an all white or all black page as a cover for an album! 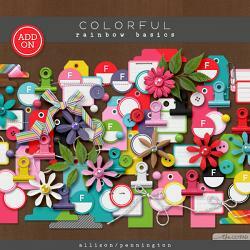 You can create a minimalistic rainbow page or fill the page! You can scrap about any topic, and photos and journalling are all optional! Also, you DO NOT need to include a photo of an actual rainbow. Feel free to create one in any way with product but using just a single pre-made rainbow element will not satisfy the requirements of this challenge. This is the page I made for this challenge focusing on paint (because the Rainbow song makes me think of pre-school and fingerpainting!) with a few elements. You might notice I used a smaller amount of pink but all 7 colours are still there and obvious. And here are some other rainbow page ideas I found on pinterest - please note: these are ideas for inspiration only to show how different designs and multiple colours can all be used to give a rainbow effect. * Use a solid black or white background. Your background can have some texture, but it should not have any pattern. * The colours must be kept separate and obvious - using 1 floral or striped patterned paper with 7 colours on it is not acceptable for this challenge. You must have a separate item or element for each colour and each colour must be clearly seen on the page. For example, you cannot use one ribbon with orange, yellow and red on it. You can use an orange ribbon, a yellow ribbon, and a red ribbon. * Extra little details in black, white, silver or gold are fine (examples: wordart, fasteners and doodles) but the 7 rainbow colours you chose should still be clearly visible. Avoid brown elements (or kraft) like wood veneer; grey areas from shadows are also fine. Have fun! I can't wait to see your pages fill the gallery with colour! Rainbows always make me happy! *Uploaded to the TLP Gallery (not an outside hosting site). *Posted in your page thread you created in the MOC Layouts Folder. You should have one post per completed challenge page. If you complete all 31 challenges, your thread should contain 31 posts. Please do not comment in the participants’ page threads so we can keep them clean. *Posted in this thread. People can comment here if they wish. MrsPeel, Psychozoe, crazsquaw and 10 others like this. 1 *Must any flowers be a solid colour or can the stamens be a neutral colour or perhaps a gemstone? 2 *The one song mentions pink - and I was taught Red, Orange, Yellow, Green, Blue, Indigo, Violet. Which one? - As long as you follow the other rules, changing the number of elements for each colour sounds like a creative way to use the rainbow! I used a few different yellow pieces with the paint but only paint for purple (no purple elements) for example, so you can definitely do more than one item for each colour! 4 * what about buttons with a thread in the center in a different color? It's a tiny detail but will they count as one of the rainbow colors? - If you are able to use buttons that have no thread or a white or black thread, they would be perfect. Extra details like thread would come under the last requirement as well. Karen, LoveItScrapIt and Ferdy like this. What an interesting and fun challenge, Justine. 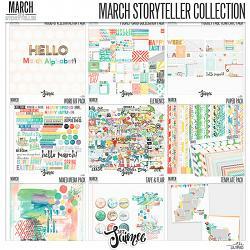 Love your inspiration layout and what great ideas from Pinterest you gave us. I'm going to have to give this one some though. 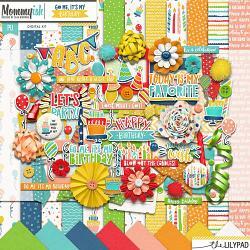 Love bright rainbow colors and love this challenge and your beautiful rainbow page! OH what fun this will be!! Wish I could start now, but I start teaching tomorrow morning and MUST get a good night' sleep!! But I can sit here for a few more moments and think about what I want to do!!!! Must any flowers be a solid colour or can the stamens be a neutral colour or perhaps a gemstone? AmandaJ, tammybean004, easyeyes4you and 12 others like this. Hi there, if your flower centre is a fastener, button or gemstone that's different to the main colour of the flower, it would fall under the last rule "Extra little details in black, white, silver or gold are fine" - the main goal here is the overall look of the page with those 7 colours being the most obvious - does that help? Just make sure to use a solid white or black background but those elements cover all 7 colours and really showcase the effect we're going for too today! Thanks for sharing! The store has so many possibilities and this is also a good mix and match challenge! I don’t typically scrap with the primary colors. This will definitely be a challenge for me. I’m gonna sleep on it! Clarification: the one song mentions pink - and I was taught Red, Orange, Yellow, Green, Blue, Indigo, Violet. you can go pastel shades, warm tones, cool tones - think about the paint guides at the hardware store, there's lots of possibilities for every colour - and if it's say, the red that worries you, you can minimise it like I did the pink on my sample page but just make sure it's there - hope that helps! As long as you follow the other rules, changing the number of elements for each colour sounds like a creative way to use the rainbow! I used a few different yellow pieces with the paint but only paint for purple (no purple elements) for example, so you can definitely do more than one item for each colour! Thanks for the response-don't want to have to redo it. iciclelady, trekmom, KittyY and 2 others like this. If in doubt with anything, always feel free to ask!